Simon Kirk is an Essex based artist, selling globally to collectors in America, Dubai, Europe and Asia. His work has sold at the Royal Academy Summer Exhibition in 2015, 2013 and 2010. His exhibition programme is steadily expanding amongst the Galleries and Art Fairs. Simon’s work has been showcased with Art Below, on Underground platforms in both London and the USA. Beginning his career in 2007, works by Simon Kirk have proved a great investment. His works are increasingly sought after by art collectors. He is a resident artist with the Turner | Barnes | Gallery and his work is regularly exhibited as part of their collections for the Hong Kong, Singapore and London Affordable Art Fairs. He has had solo exhibitions in France, Denmark and the USA. His practice associates images and cut-up text that helps us view everyday life with fresh eyes. 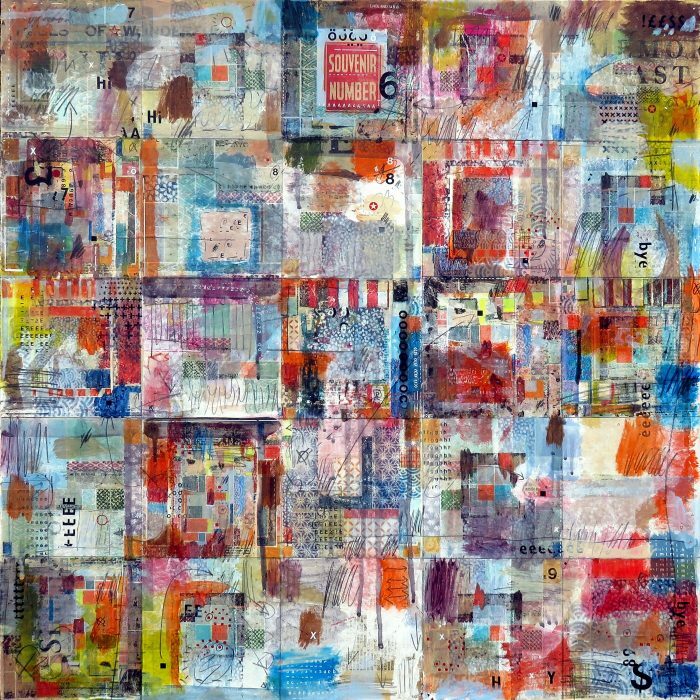 The work is primarily layers of painting combined with collaged elements. He also uses the decollage technique – cutting, tearing or sanding away parts of the built up surface image to reveal layers below. Across his many styles of art, ranging from Fine Art Oil Paintings to Pop Art collage works, there is something for all tastes. ‘Souvenir Number 6’ is an original mixed media piece by pop artist Simon Kirk. Simon Kirk’s art consists of layers of paint and collaged elements. He uses decollage techniques including cutting, tearing or sanding away parts of the built up surface image to reveal layers below. This piece is signed by the artist. ‘Day’ is an original mixed media piece by pop artist Simon Kirk. His practice associates images and cut-up text that helps us view everyday life with fresh eyes. ‘Night’ is an original mixed media piece by pop artist Simon Kirk. ‘Gobble Time’ is an original mixed media piece by pop artist Simon Kirk. ‘Summertime Orange’ is a Limited Edition 2 colour Screen print on to Somerset Velvet Newsprint 250gsm paper by pop artist Simon Kirk. ‘Summertime Green’ is a Limited Edition 2 colour Screen print on to Somerset Velvet Newsprint 250gsm paper by pop artist Simon Kirk. ‘Summertime Pink’ is a Limited Edition 2 colour Screen print on to Somerset Velvet Newsprint 250gsm paper by pop artist Simon Kirk. ‘Summertime Blue’ is a Limited Edition 2 colour Screen print on to Somerset Velvet Newsprint 250gsm paper by pop artist Simon Kirk. ‘Summertime Yellow’ is a Limited Edition 2 colour Screen print on to Somerset Velvet Newsprint 250gsm paper by pop artist Simon Kirk. ‘Drama’ is a Limited Edition 8 colour Screen print on to Somerset Newsprint 250gsm paper by pop artist Simon Kirk. ‘Water’ is a Limited Edition 8 colour Screen print on to Somerset Newsprint 250gsm paper by pop artist Simon Kirk. ‘Letter’ is a Limited Edition 5 colour Screen print on to Somerset Newsprint 250gsm paper by pop artist Simon Kirk. ‘Fitter and Brighter’ is a Limited Edition 8 colour Screen print on to Somerset Newsprint 250gsm paper by pop artist Simon Kirk. ‘Exotic’ is a Limited Edition 10 colour Screen print on to Somerset Newsprint 250gsm paper by pop artist Simon Kirk. ‘The Puppeteer’ is an original mixed media piece by pop artist Simon Kirk. ‘Dreamland’ is an original mixed media piece by pop artist Simon Kirk. ‘Rain King’ is an original mixed media piece by pop artist Simon Kirk. ‘The End’ is an original mixed media piece by pop artist Simon Kirk. Riddles is an original mixed media piece by pop artist Simon Kirk. 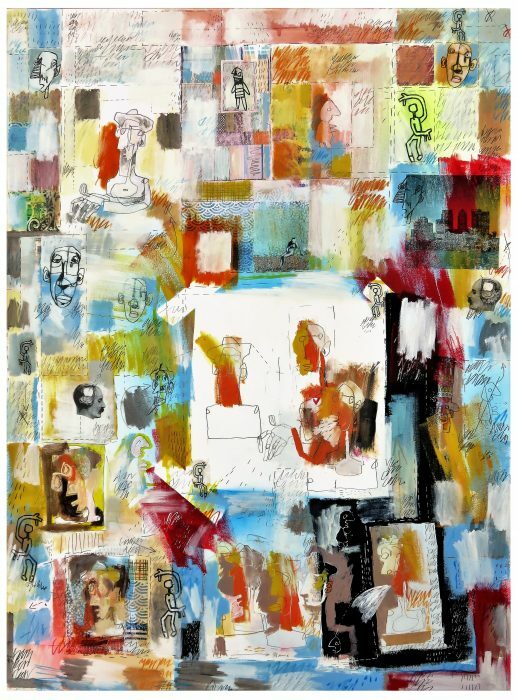 Riddles is an original mixed media piece using layers of paint and collage on a wooden panel by pop artist Simon Kirk. Skidoos is an original mixed media piece by pop artist Simon Kirk. ‘Mojarra’ is an original mixed media piece by pop artist Simon Kirk. Simon Kirk’s art is primarily layers of painting combined with collaged elements. He also uses decollage techniques including cutting, tearing or sanding away parts of the built up surface image to reveal layers below. 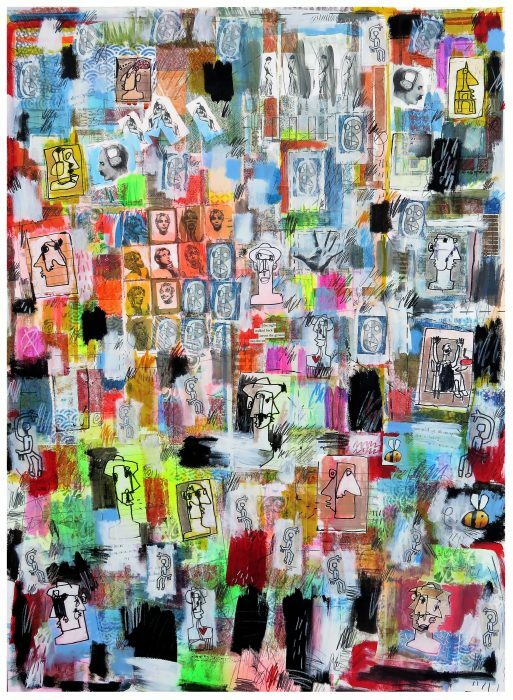 Calumet is an original mixed media piece by pop artist Simon Kirk. An original mixed media piece by pop artist Simon Kirk. Dive is an original collage & painted piece of art by pop artist Simon Kirk. This piece is from Simon Kirk’s Mini Sketch Book Series and is signed by the artist. ‘Age’ is an original collage & painted piece of art by pop artist Simon Kirk. ‘Belly Button Barney’ is an original collage & painted piece of art by pop artist Simon Kirk. 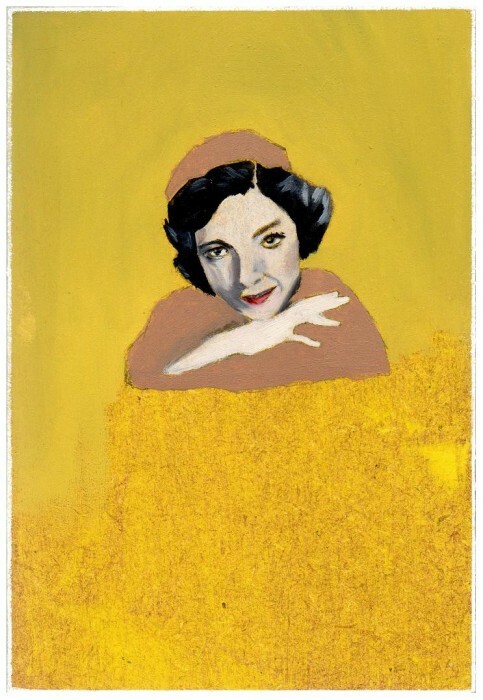 ‘Betty’ is an original collage & painted piece of art by pop artist Simon Kirk. ‘Bubble’ is an original collage & painted piece of art by pop artist Simon Kirk. ‘Coo Coos’ is an Original collage & painted piece of art by pop artist Simon Kirk. ‘Brigham’ is an original mixed media piece of art by pop artist Simon Kirk. Simon Kirk’s work is primarily layers of painting combined with collaged elements. He also uses decollage techniques including cutting, tearing or sanding away parts of the built up surface image to reveal layers below. ‘Rotocity’ is an original mixed media piece by pop artist Simon Kirk. ‘Tucumclari’ is an original mixed media piece by pop artist Simon Kirk. ‘Palm Pigs’ is a brilliant original collage & painted piece of art by contemporary pop artist Simon Kirk. “A piece from my main body of work, that combines painting, collage and decollage (ripping, tearing or sanding away at built up surfaces to reveal layers below). In these works the text and image combine to create a self contained scenario with its own reality, and the viewer is invited to inhabit it. There is no undue wordiness; the inherent simplicity of the cut up leaves a lot of room for the viewer to find their own meaning. I’m a big fan of haiku, the finding of profound meaning in modest things and the gentle playfulness that helps us view everyday life with fresh eyes. ‘Freshly Plucked Pippa’ is a stunning original collage & painted piece of art by contemporary pop artist Simon Kirk. ‘Liquor’ is a marvellous original collage & painted piece of art by contemporary pop artist Simon Kirk. ‘Everlasting Edward’ is a vibrant original collage & painted piece of art by contemporary pop artist Simon Kirk. ‘Disco Pond’ is a vibrant original collage & painted piece of art by contemporary pop artist Simon Kirk. ‘Wine’ is a splendid original collage & painted piece of art by contemporary pop artist Simon Kirk. ‘Oskar’ is a striking original collage & painted piece of art by contemporary pop artist Simon Kirk. ‘Lopo’ is a wonderful original collage & painted piece of art by contemporary pop artist Simon Kirk. ‘Crestfallen’ is a fantastic original collage & painted piece of art by contemporary pop artist Simon Kirk. ‘People’ is a fabulous collection of original collage & painted pieces of art by contemporary artist Simon Kirk. ‘Fragments of Conversation’ is a fabulous collection of original collage & painted pieces of art by contemporary artist Simon Kirk. ‘Dangler’ is a fantastic original collage & painted piece of art by contemporary pop artist Simon Kirk. A piece from my main body of work, that combines painting, collage and decollage (ripping, tearing or sanding away at built up surfaces to reveal layers below). I like to use this device a lot. The cut ups often follow a path of taking the wonder of these small things and subverting them into something manic and fierce or poetic and evocative. The characters within the scenarios I create are challenged with weird and impossible predicaments, and the viewer is asked to join them in confronting the strangeness. This work started as a simple white line drawing on dark background. There’s something very appealing to me working in this ‘negative’ way. It was a delicate balancing act to flesh the piece out with paint whilst still keeping the simplicity and space. Before Simon developed his current style he was predominantly a figurative painter, quite traditional in that sense. He still enjoys the relative calm of oil paintings, free from the labour intensive layering process of decollage and the juxtapositions images and text. Being a big film fan, and this oil sketch evolved into a simple portrait recalling the iconic colour saturated Hollywood films of the 50s and 60s. These paintings have simple compositions, limited palettes and deal primarily with the notion of solitude.